Real Madrid superstar Cristiano Ronaldo and former manager of the club, Jose Mourinho, had to be held back by other players of the team, after both individuals came close to exchanging blows during a dressing room bust-up in 2013, a new book has claimed. The incident took place following the first leg of the Copa Del Rey quarter-final between Real Madrid and Valencia in 2013, Spanish football journalist Guillem Balague has claimed in his new book Cristiano Ronaldo: Biography, which has been serialised in The Telegraph. The disagreement between Mourinho and Ronaldo arose after the manager asked the latter to track back and defend during the final stages of the game, which Real went on to win 2-0. Ronaldo ignored Mourinho's instructions, and the latter proceeded to hand his player a dressing down at the end of the game. 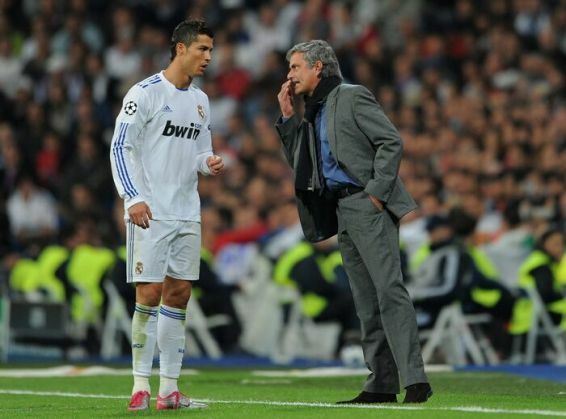 Ronaldo didn't take Mourinho's comments well, and a heated discussion ensued between the duo. As the disagreement continued, the pair came close to blows, claims Balague. Ronaldo's teammates had to eventually step in and hold back the Portuguese international, in order to calm things down. While Real Madrid went on to reach the Copa Del Rey final, the relationship between Mourinho and Ronaldo never recovered after the incident. The Portuguese manager eventually left Real Madrid in the summer of 2013 and moved back to his old stomping ground, Chelsea.